The first student selected photos of the Moon’s surface snapped by NASA’s new pair of student named Lunar Mapping orbiters – Ebb & Flow – have just been beamed back and show an eerie view looking back to the Home Planet – and all of Humanity – barely rising above the pockmarked terrain of the mysterious far side of our nearest neighbor in space. Congratulations to Americas’ Youth on an outstanding and inspiring choice !! The student photo is reminiscent of one of the iconic images of Space Exploration – the first full view of the Earth from the Moon taken by NASA’s Lunar Orbiter 1 back in August 1966 (see below). The images were taken in the past few days by the MoonKAM camera system aboard NASA’s twin GRAIL spacecraft currently circling overhead in polar lunar orbit, and previously known as GRAIL A and B. The formation-flying probes are soaring over the Moon’s north and south poles. The nearly identical ships were rechristened as Ebb and Flow after Fourth grade students from the Emily Dickinson Elementary School in Bozeman, Mont., won the honor to rename both spacecraft by submitting the winning entries in a nationwide essay competition sponsored by NASA. “The Bozeman 4th graders had the opportunity to target the first images soon after our science operations began,” said Maria Zuber, GRAIL principal investigator of the Massachusetts Institute of Technology in Cambridge, Mass., to Universe Today. The initial packet of some 66 student-requested digital images from the Bozeman kids were taken by the Ebb spacecraft from March 15-17 and downlinked to Earth March 20. They sure have lots of exciting classwork ahead analyzing all those lunar features ! “GRAIL’s science mapping phase officially began on March 6 and we are collecting science data,” Zuber stated. GRAIL’s science goal is to map our Moon’s gravity field to the highest precision ever. This will help deduce the deep interior composition, formation and evolution of the Moon and other rocky bodies such as Earth and also determine the nature of the Moon’s hidden core. Engaging students and the public in science and space exploration plays a premier role in the GRAIL project. GRAIL is NASA’s first planetary mission to carry instruments – in the form of cameras – fully dedicated to education and public outreach. Over 2,700 schools in 52 countries have signed up to participate in MoonKAM. 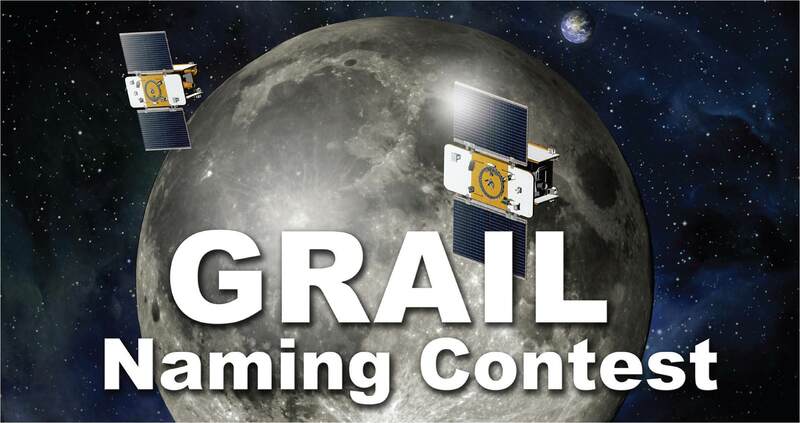 5th to 8th grade students can send suggestions for lunar surface targets to the GRAIL MoonKAM Mission Operations Center at UC San Diego, Calif. Students will use the images to study lunar features such as craters, highlands, and maria while also learning about future landing sites. NASA calls MoonKAM – “The Universe’s First Student-Run Planetary Camera”. MoonKAM means Moon Knowledge Acquired by Middle school students. The MoonKAM project is managed by Dr Sally Ride, America’s first female astronaut. Altogether there are eight MoonKAM cameras aboard Ebb and Flow – one 50 mm lens and three 6 mm lenses. Each probe is the size of a washing machine and measures just over 3 feet in diameter and height. Snapping the first images was delayed a few days by the recent series of powerful solar storms. “Due to the extraordinary intensity of the storms we took the precaution of turning off the MoonKAMs until the solar flux dissipates a bit,” Zuber told me. The washing-machine sized probes have been flying in tandem around the Moon since entering lunar orbit in back to back maneuvers over the New Year’s weekend. Engineers spent the past two months navigating the spaceship duo into lower, near-polar and near-circular orbits with an average altitude of 34 miles (55 kilometers) that are optimized for science data collection and simultaneously checking out the spacecraft systems. Ebb and Flow were launched to the Moon on September 10, 2011 aboard a Delta II rocket from Cape Canaveral, Florida and took a circuitous 3.5 month low energy path to the moon to minimize the overall costs. The Apollo astronauts reached the Moon in just 3 days. NASA’s next generation Orion space capsule currently under development will send American astronauts back to lunar orbit by 2021 or sooner. NASA has just granted an extension to the GRAIL mission. Watch for my follow-up report detailing the expanded science goals of GRAIL’s extended lunar journey. A first look from GRAIL, showing the lunar far side! A camera aboard ‘Ebb’ — one of NASA’s twin Gravity Recovery And Interior Laboratory (GRAIL) lunar spacecraft has returned its first unique view of the far side of the Moon. The camera is the MoonKAM, which is part of a special program for students to study the Moon. “The quality of the video is excellent and should energize our MoonKAM students as they prepare to explore the Moon,” said Maria Zuber, GRAIL principal investigator. Has the International Space Station (ISS) secretly joined NASA’s newly arrived GRAIL lunar twins orbiting the Moon? No – but you might think so gazing at these dazzling new images of the Moon and the ISS snapped by a NASA photographer yesterday (Jan. 4) operating from the Johnson Space Center in Houston, Texas. Check out this remarkable series of NASA photos above and below showing the ISS and her crew of six humans crossing the face of Earth’s Moon above the skies over Houston, Texas. And see my shot below of the Moon near Jupiter – in conjunction- taken just after the two GRAIL spacecraft achieved lunar orbit on New Year’s weekend. In the photo above, the ISS is visible at the upper left during the early evening of Jan. 4, and almost looks like it’s in orbit around the Moon. In fact the ISS is still circling about 248 miles (391 kilometers) above Earth with the multinational Expedition 30 crew of astronauts and cosmonauts hailing from the US, Russia and Holland. The amazing photo here is a composite image showing the ISS transiting the Moon’s near side above Houston in the evening hours of Jan 4. The ISS is the brightest object in the night sky and easily visible to the naked eye if it’s in sight. With a pair of binoculars, it’s even possible to see some of the stations structure like the solar panels, truss segments and modules. Check this NASA Website for ISS viewing in your area. How many of you have witnessed a sighting of the ISS? It’s a very cool experience ! NASA says that some especially good and long views of the ISS lasting up to 6 minutes may be possible in the central time zone on Friday, Jan 6 – depending on the weather and your location. Take a good close look at the Moon today and consider this; Two new Moon’s just reached orbit. NASA is ringing in the New Year with a double dose of champagne toasts celebrating the back to back triumphal insertions of a pair of tiny probes into tandem lunar orbits this weekend that seek to unravel the hidden mysteries lurking deep inside the Moon and figure out how the inner solar system formed eons ago. Following closely on the heels of her twin sister, NASA’s GRAIL-B spacecraft ignited her main braking rockets precisely as planned on New Year’s Day (Jan.1) to go into a formation flying orbit around the Moon, chasing behind GRAIL-A which arrived on New Year’s Eve (Dec. 31). “Now we have them both in orbit. What a great feeling!!! !” NASA manager Jim Green told Universe Today just minutes after the thruster firing was done. Green is NASA’s Director of Planetary Science and witnessed the events inside Mission Control at the Jet Propulsion Laboratory (JPL) in Pasadena, Ca. “It’s the best New Year’s ever! !” Green gushed with glee. The new lunar arrivals of GRAIL-A and GRAIL-B capped a perfect year for NASA’s Planetary Science research in 2011. “2011 began the Year of the Solar System – which is a Mars year (~670 Earth days long)… and includes Grail B insertion, Dawn leaving Vesta this summer … And the landing of MSL! ,” Green said. NASA’s GRAIL-A & GRAIL-B are orbiting the Moon in this image taken on Jan. 2, 2012 after Lunar Orbit Insertions on New Year’s Weekend. Click to enlarge. “Cheers in JPL mission control as everything is looking good for GRAIL-B. It’s going to be a great 2012! !” JPL tweeted shortly after confirming the burn successfully placed GRAIL-B into the desired elliptical orbit. After years of hard work, GRAIL principal investigator Maria Zuber of MIT told Universe Today that she was very “relieved”, soon after hearing the good news at JPL Mission Control. “Since GRAIL was originally selected I’ve believed this day would come,” Zuber told me shortly after the GRAIL-B engine firing was declared a success on New Year’s Day. At 2:43 p.m. PST (5:43 p.m. EST) on New Year’s Day, the main thruster aboard GRAIL-B automatically commenced firing to slow down the spacecraft’s approach speed by about 430 MPH (691 kph) and allow it to be captured into orbit by the Moon’s gravity. The preprogrammed maneuver lasted about 39 minutes and was nearly identical to the GRAIL-A firing 25 hours earlier. The hydrazine fueled main thrusters placed the dynamic spacecraft duo into near-polar, highly elliptical orbits. Over the next two months, engineers will trim the orbits of both spacecraft to a near-polar, near-circular formation flying orientation. Their altitudes will be lowered to about 34 miles (55 kilometers) and the orbital periods trimmed from their initial 11.5 hour duration to about two hours. The science phase begins in March 2012. For 82 days, the mirror image GRAIL-A and GRAIL-B probes will be flying in tandem with an average separation of about 200 kilometers as the Moon rotates beneath. As one satellite follows the other, in the same orbit, they will perform high precision range-rate measurements to precisely measure the changing distance between each other to within 1 micron, the width of a red blood cell, using a Ka-band instrument. When the first satellite goes over a higher mass concentration, or higher gravity, it will speed up slightly. And that will increase the distance. Then as the second satellite goes over, that distance will close again. The data returned will be translated into gravitational field maps of the Moon that will help unravel information about the makeup of the Moon’s mysterious core and interior composition. GRAIL will gather three complete gravity maps over the three month mission. “We think the answer is locked in the interior,” Zuber elaborated. How will the twins be oriented in orbit to gather the data ? GRAIL will map the gravity field by 100 to 1000 times better than ever before. “We will learn more about the interior of the Moon with GRAIL than all previous lunar missions combined,” says Ed Weiler, the recently retired NASA Associate Administrator of the Science Mission Directorate in Washington, DC. The GRAIL twins blasted off from Florida mounted side by side atop a Delta II booster on September 10, 2011 and took a circuitous 3.5 month low energy path to the Moon to minimize the overall costs. So when you next look at the sky tonight and in the coming weeks just imagine those mirror image GRAIL twins circling about seeeking to determine how we all came to be ! GRAIL team at JPL toasts success as twin spacecraft both went into orbit around the Moon on New Year’s weekend. A year ago, 2011 was proclaimed as the “Year of the Solar System” by NASA’s Planetary Science division. And what a year of excitement it was indeed for the planetary science community, amateur astronomers and the general public alike ! NASA successfully delivered astounding results on all fronts – On the Story of How We Came to Be. This past year was without doubt simply breathtaking in scope in terms of new missions, new discoveries and extraordinary technical achievements. The comprehensive list of celestial targets investigated in 2011 spanned virtually every type of object in our solar system – from the innermost planet to the outermost reaches nearly touching interplanetary space. There was even a stunningly evocative picture showing “All of Humanity” – especially appropriate now in this Holiday season ! You and all of Humanity are here ! Three brand new missions were launched and ongoing missions orbited a planet and an asteroid and flew past a comet. “NASA has never had the pace of so many planetary launches in such a short time,” said Green. And three missions here were awarded ‘Best of 2011’ for innovation ! Starting from the first moments of 2011 at the dawn of Jan. 1, hopes were already running high for planetary scientists and engineers busily engaged in setting up a romantic celestial date in space between a volatile icy comet and an aging, thrusting probe on Valentine’s Day. The comet chasing Stardust-Next spacecraft successfully zoomed past Comet Tempel 1 on Feb. 14 at 10.9 km/sec (24,000 MPH) after flying over 6 Billion kilometers (3.5 Billion mi). Tempel 1 is the first comet to be visited by two spaceships from Earth and provided the first-ever opportunity to compare observations on two successive passages around the Sun. “The new images of Tempel showed features that form a link between seemingly disparate surface features of the 4 comets imaged by spacecraft. Combining data on the same comet from the Deep Impact and Stardust missions has provided important new insights in to how comet surfaces evolve over time and how they release gas and dust into space”. On March 18, the Mercury Surface, Space Environment, Geochemistry, and Ranging, or MESSENGER, spacecraft became the first spacecraft inserted into orbit around Mercury, the innermost planet. So far MESSENGER has completed 1 solar day – 176 Earth days- circling above Mercury. The probe has collected a treasure trove of new data from the seven instruments onboard yielding a scientific bonanza; these include global imagery of most of the surface, measurements of the planet’s surface chemical composition, topographic evidence for significant amounts of water ice, magnetic field and interactions with the solar wind. “MESSENGER discovered that Mercury has an enormous core, larger than Earth’s. We are trying to understand why that is and why Mercury’s density is similar to Earth’s,” Jim Green explained to Universe Today. “NASA has granted a 1 year mission extension, for a total of 8 Mercury years. This will allow the team to understand the environment at Mercury during Solar Maximum for the first time. All prior spacecraft observations were closer to solar minimum,” said Green. MESSENGER was launched in 2004 and the goal is to produce the first global scientific observations of Mercury and piece together the puzzle of how Mercury fits in with the origin and evolution of our solar system. NASA’s Mariner 10 was the only previous robotic probe to explore Mercury, during three flyby’s back in the mid-1970’s early in the space age. The Dawn spacecraft achieved orbit around the giant asteroid Vesta in July 2011 after a four year interplanetary cruise and began transmitting the history making first ever close-up observations of the mysteriously diverse and alien world that is nothing short of a ‘Space Spectacular’. “We do not have a good analog to Vesta anywhere else in the Solar System,” Chris Russell said to Universe Today. Russell, from UCLA, is the scientific Principal Investigator for Dawn. Before Dawn, Vesta was just another fuzzy blob in the most powerful telescopes. Dawn has completely unveiled Vesta as a remarkably dichotomous, heavily battered and pockmarked world that’s littered with thousands of craters, mountains and landslides and ringed by mystifying grooves and troughs. It will unlock details about the elemental abundances, chemical composition and interior structure of this marvelously intriguing body. Cataclysmic collisions eons ago excavated Vesta so it lacks a south pole. Dawn discovered that what unexpectedly remains is an enormous mountain some 16 miles (25 kilometers) high, twice the height of Mt. Everest. Dawn is now about midway through its 1 year mission at Vesta which ends in July 2012 with a departure for Ceres, the largest asteroid. So far the framing cameras have snapped more than 10,000 never-before-seen images. “What can be more exciting than to explore an alien world that until recently was virtually unknown!. ” Dr. Marc Rayman said to Universe Today. Rayman is Dawn’s Chief Engineer from NASA’s Jet Propulsion Lab (JPL) in Pasadena, Calif. The solar powered Juno spacecraft was launched on Aug. 5 at Cape Canaveral Air Force Station in Florida, to embark on a five year, 2.8 billion kilometer (1.7 Billion mi) trek to Jupiter, our solar system’s largest planet. It was the first of three NASA planetary science liftoffs scheduled in 2011. Juno’s goal is to map to the depths of the planets interior and elucidate the ingredients of Jupiter’s genesis hidden deep inside. These measurements will help answer how Jupiter’s birth and evolution applies to the formation of the other eight planets. The 4 ton spacecraft will arrive at the gas giant in July 2016 and fire its braking rockets to go into a polar orbit and circle the planet 33 times over about one year. The suite of nine instruments will scan the gas giant to find out more about the planets origins, interior structure and atmosphere, measure the amount of water and ammonia, observe the aurora, map the intense magnetic field and search for the existence of a solid planetary core. The long lived Opportunity rover finally arrived at the rim of the vast 14 mile (22 kilometer) wide Endeavour Crater in mid-August 2011 following an epic three year trek across treacherous dune fields – a feat once thought unimaginable. All told, Opportunity has driven more than 34 km ( 21 mi) since landing on the Red Planet way back in 2004 for a mere 90 sol mission. In November, the rover discovered the most scientifically compelling evidence yet for the flow of liquid water on ancient Mars in the form of a water related mineral vein at a spot dubbed “Homestake” along an eroded ridge of Endeavour’s rim. Read my story about the Homestake discovery here, along with our panoramic mosaic showing the location – created by Ken Kremer and Marco Di Lorenzo and published by Astronomy Picture of the Day (APOD) on 12 Dec. 2011. Watch for my upcoming story detailing Opportunity’s accomplishments in 2011. The Gravity Recovery and Interior Laboratory, or GRAIL mission is comprised of twin spacecraft tasked to map the moon’s gravity and study the structure of the lunar interior from crust to core. The dynamic duo lifted off from Cape Canaveral on September 10, 2011 atop the last Delta II rocket that will likely soar to space from Florida. After a three month voyage of more than 2.5 million miles (4 million kilometers) since blastoff, the two mirror image GRAIL spacecraft dubbed Grail-A and GRAIL-B are sailing on a trajectory placing them on a course over the Moon’s south pole on New Year’s weekend. Each spacecraft will fire the braking rockets for about 40 minutes for insertion into Lunar Orbit about 25 hours apart on New Year’s Eve and New Year’s Day. Engineers will then gradually lower the satellites to a near-polar near-circular orbital altitude of about 34 miles (55 kilometers). The spacecraft will fly in tandem and the 82 day science phase will begin in March 2012. The Curiosity Mars Science Lab (MSL) rover soared skywards on Nov. 26, the last of 2011’s three planetary science missions. Curiosity is the newest, largest and most technologically sophisticated robotic surveyor that NASA has ever assembled. “MSL packs the most bang for the buck yet sent to Mars.” John Grotzinger, the Mars Science Laboratory Project Scientist of the California Institute of Technology, told Universe Today. The three meter long robot is the first astrobiology mission since the Viking landers in the 1970’s and specifically tasked to hunt for the ‘Ingredients of Life’ on Mars – the most Earth-like planet in our Solar System. Curiosity will gather and analyze samples of Martian dirt in pursuit of the tell-tale signatures of life in the form of organic molecules – the carbon based building blocks of life as we know it. NASA is targeting Curiosity to a pinpoint touch down inside the 154 km (96 mile) wide Gale Crater on Aug. 6, 2012. The crater exhibits exposures of phyllosilicates and other minerals that may have preserved evidence of ancient or extant Martian life and is dominated by a towering 3 mile (5 km) high mountain. “10 science instruments are all aimed at a mountain whose stratigraphic layering records the major breakpoints in the history of Mars’ environments over likely hundreds of millions of years, including those that may have been habitable for life,” Grotzinger told me. This past year Ken was incredibly fortunate to witness the ongoing efforts of many of these magnificent endeavors.